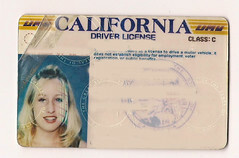 jennster's blog: the evolution of my driver's license pictures! 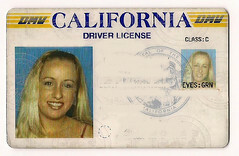 i just got my new license picture in the mail and so i thought i'd post all my license pictures throughout the years!!! not to mention super embarassing. whose idea was this anyway?? um.. here's the next one. i think i was like 22 in this pic. wtf is going on with my hair? i mean, i'm really asking because i have no clue what i did to it. why the f am i so white?!??!! i was never this white.. .omg, cause i bet this was when i lived in stupid san jose and of course i was white, cause we could never go to the beach. gross. and here it is. my newest pic! i don't love it. i barely like it. i'm half tempted to go yell at the guy who took my pic and told me it was hot. he was either lying, blind or just hated me. i wish you could tell how mother f'n fantastic my eyelashes were this day. argh. 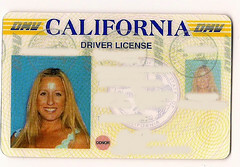 I had a CA license for a few years... seriously, best. pic. ever. I was going to keep it forever. And then I got pulled over once I was back in NV and as I was rifling through all my cards to give him my NV DL, the cop SAW my CA license and HE TOOK IT!!!! So. PISSED. 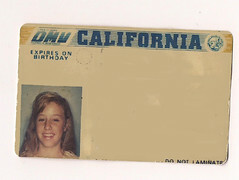 I have managed to hang on to a couple of my old licenses... not that I know where they are or anything. Sorry, I'm back to why couldn't you go to the beach when you lived in San Jose? It was less than half an hour a way!!!! this is a great idea!! love it!